I started this series a while ago, and was hooked. Lia is a princess who is set, by her parents, to marry a prince from a neighboring country. She's less than thrilled by this edict, and instead of submitting, runs away with her lady-in-waiting, Pauline. The first book sees them on the run, and hiding out from bounty hunters they've been told were sent by Lia's father. Assuming new identities, they find work at an inn, and when they meet two young men at the inn, things go from bad to worse. Neither men is who they seem, and this spells trouble for everyone. 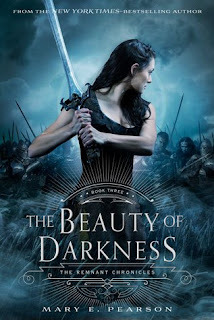 I don't want to spoil anyone, so I won't go into what happens in the rest of the book, or book two, but if you're a fan of badass ladies, who are fiercely loyal, and like to buck tradition, this is a great series for you. I will say, in parts of the book, I think the author is alluding to the fact that the Remnant (those chosen after an apocalypse wipes out all of society,) is the United States, and mention of the "ancients," lost temples and cities feels a bit meh to me. I much prefer the idea that all of the countries are actually complete fiction and not based on our current existence. I could be wrong, but it was the only off note in the books for me. Lia and her relationships with the two young men, Pauline, and everyone back in her home as well as the people she meets on her journey are well written. You get to see each of the main characters understand, work through, and eventually accept their own fate and place within the overall fate of the world. The one bummer I had was that the ending wasn't exactly as I'd hoped, but c'est la vie, right? I still liked it, and felt it made sense for the characters.